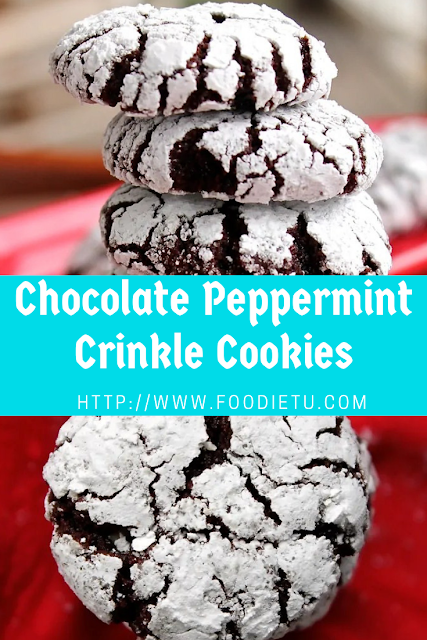 These Chocolate Peppermint Crinkle Cookies are perfect for the holidays. Crispy on the outside and soft and fudge-y in the middle. Made in under 30 minutes. In a small bowl combine flour, salt, and baking powder. Set aside. In a medium bowl or stand up mixer stir together cocoa powder, sugar, applesauce, oil, extracts, and peppermint candies (if using) until well blended. Add flour mixture and mix until just combined. Wrap the dough in plastic wrap and chill for 4 hours. Preheat the oven to 350 degrees F. Line two baking sheets with parchment paper. Place the granulated and powdered sugars in two separate bowls.